If you are in the real estate business, you probably know that no buyer can concede to spend his or her money on your property, unless you have the proof that you are the rightful and legal owner of the property in question. As such, you need to make sure you do the best you can to have the right documents ready in place if you want to make a sale. You already know a lot about the statutory warranty deed. 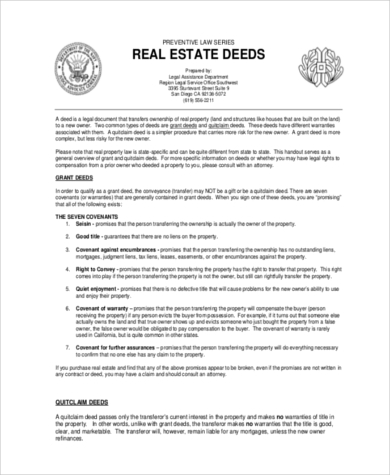 Now it is time to look at the best Deed Forms that you can use in your real estate business. Whether you are selling a property at a fixed price or at a fair price, you will still need to prepare a warranty deed. And, here is the best same form that you can download and use for free. Did you know that you can now download a grant deed form for free? Here is the best sample file that you can use. It is suitable for personal as well as business use. And it is easy to edit. You may also see Quit Claim Deed Forms. 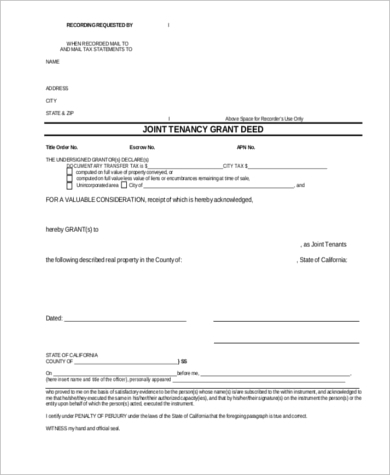 If you are dealing with a couple of clients who are renting properties to buy, then you must have a joined tenancy grant deed at the time of official sale. Use the following sample form. 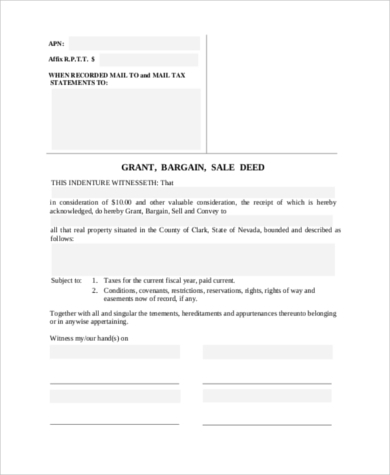 Real estate grant deeds are specifically for real estate business. But property owners can use them, too. They are the right files to use when selling a property because you must transfer the ownership of rights also. Unless you are willing to transfer the ownership rights of a property to a willing buyer, they may not be willing to trust you nearly as much. As such, consider having a grant deed in ace if you want to make a good deal. 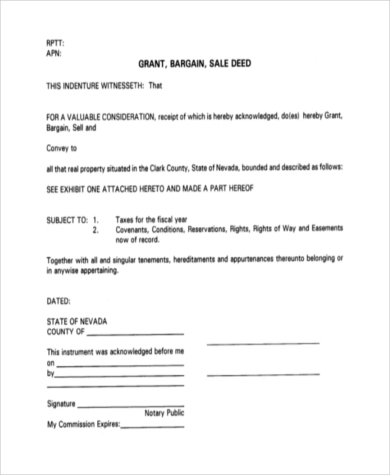 You can also see Warranty Deed Forms. Do you know that it takes less time to create and use a grant deed? 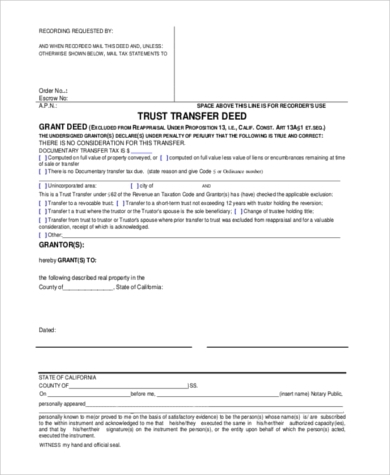 All you have to do is download the right grant deed form for free, and then use it to transfer these rights. Before anyone agrees to buy your property, he or she will need to be sure that they will be having all the ownership rights transferred to them. As such, you should be using this grant deed to do so. Land transfer deed is the document you use to tell a buyer that you are the right owner of a property. That there won’t be a problem arising in the future after selling the property. You may also see Special Warranty Deed Forms. 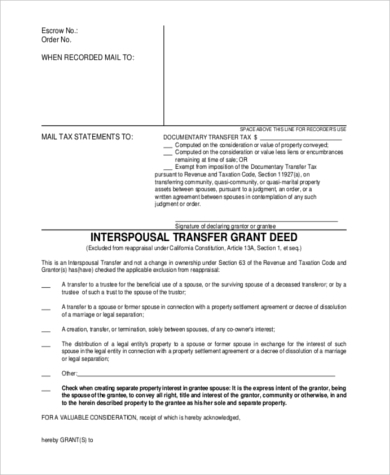 Why is a Grant Deed Important? Before you can sell a property to someone today, you need to ask yourself whether they are going to trust you if you do not provide them with assurance and proof of the legitimacy of the product in question. 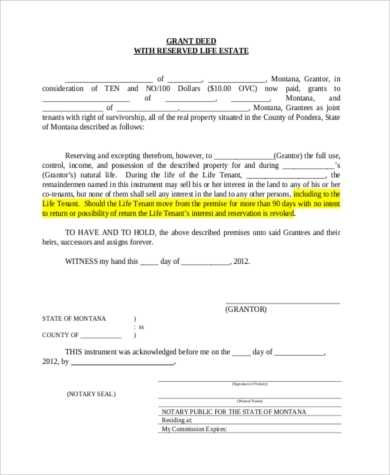 More often than not, they always require documented proofs and a fully signed document signifying the transfer of the ownership of rights of the property in question. As such, you must have a grant deed readily in place before you can make a next big sale. You can also see General Warranty Deed Forms. These sample forms are available for free download. The goal of each file is the same: to save you as much time as possible so that you don’t have to waste time on the design of the templates. At the end of the day, these files make your work easy, because you never have to spend a lot of time on your computer trying to do the design yourself. Unless you can prove that you are the legal owner of the property in question, then one thing is for sure, it is going to be hard for you to make a sale. 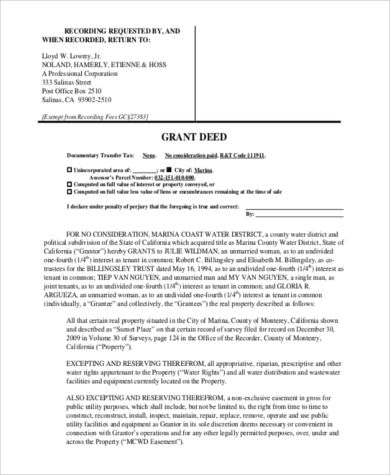 These files are thus the best tools that you can use to provide a legal proof that you not only own the property but also you have the rights to sell whomever you want.